We survived the second day of AGBT, and the conference is officially in full swing. After an intense day of sessions focused on clinical genomics, the evening took us back to the technology talks that have long been the foundation of this meeting. One of the speakers last night was Tim Smith, a molecular geneticist with the USDA Agricultural Research Service, who gave a presentation entitled “Deep Sequencing of Immune Repertoires During Bovine Development and in Response to Respiratory Pathogen Challenge.” In it, he spoke about using circular consensus sequencing on the PacBio RS to characterize the immune repertoire in cattle. Smith said that bovine respiratory disease complex costs the cattle industry some $700 million to $1 billion annually, which is why it was the focus of his research program to understand the immune response and look for shared determinants related to specific immune challenges. He noted that using circular consensus sequencing with PacBio was especially useful for analyzing this immunoglobulin region in cattle, where the variable genetic region is significantly longer than it is for humans and some other organisms and for which he had no germline sequence to work from. 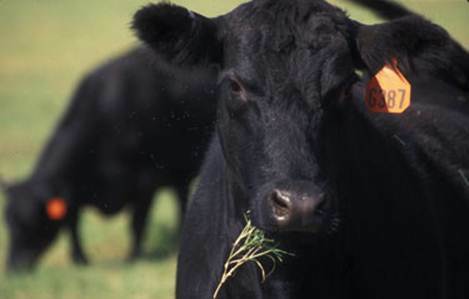 The PacBio reads were able to provide high-quality, single-molecule sequencing from 400-700 base PCR products, which is needed to properly characterize this region in cows. Smith compared sequence data from healthy calves and calves that had been infected and had triggered an immune response. Two sequences in particular emerged that were regularly seen in the infected animals but never seen in the healthy ones. Smith said this was a small pilot project and he has plans to expand on what he found, but these results suggest that it is possible to profile the immune repertoire, find shared determinants in infected animals, and perhaps ultimately use those to track illness or immunization results.